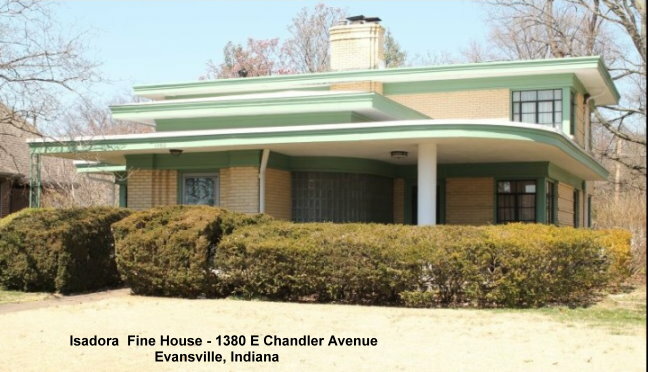 Although the architectural emphasis in Lincolnshire was revival, attorney Isadore Fine liked a contemporary style of residence. To meet his tastes, the developers produced this ultramodern variant of the Prairie style. Anderson and Veatch carried out the design by using flat roofs and unusual-colored buff brick. A curved front porch, and similarly contoured glass block wall, help to visually minimize the massing weight of the house. The interior of the home featured such modern techniques and materials as smoothly plastered walls, caseless and curved-corner doorways with flush-type doors, soffit lighting, Cararra glass, Nu-Wood, and Armstrong Cork floor tile. The house also boasted a central air-conditioning system, reportedly the first residential installation in Evansville. Isadore Fine was a senior member of the law firm Fine, Hatfield, Sparrenberger, and Fine. He was president of the Evansville Bar Association in 1944, and also served on the board of directors for Lamasco Bank and Permanent Federal Savings and Loan Association. Fine was also vice-president of the family-owned Premier Television, Inc., which is credited with bringing television to Evansville in 1953 with the advent of station WFIE.